Okay…I know what you are thinking. How can a vegetarian possibly consume a product that is called “Cheeseburger Mac?” Well…there are a couple of different ways to go about it. Gluten-Free Soy Crumbles. Gluten-Free TVP. Or…the way I handled it…adding Trader Joe’s Gluten-Free Soy Chorizo. Because when you have to make a vegetarian version of a Cheeseburger Mac…you might as well do it up with something spicy and different. Right? RIGHT! So…here’s the story. Recently, a bunch of items went on closeout at a local grocery store. I’d been meaning to try some of the Mrs. Leeper’s products, but just never found a reason to pay for them. While not overly priced as far as gluten-free products go…all need to have some sort of meat added to them. Originally, I imagined I could just cook up some tofu and substitute it for the lean beef in this recipe. But…being that I’m on a tight and strict food budget these days…I had to go with something in house. Something I already had. And in my refrigerator, calling to me from my shelf…was Trader Joe’s Gluten-Free Soy Chorizo (IT’S BACK!). BINGO! Not that I needed to use this product up just yet…but two weeks in a row without my CSA bin has left me sifting and sorting through things in my pantry and freezer. And I figured there was no time like the present to make this one up. Especially since I had a substitute for the meat already in my apartment. After another long, stressful, and busy day at the office, I was quite happy with coming home to cook this up. Why? Because it literally takes 15 minutes to make. That’s it. Super easy…and not finicky. You don’t need to stand over it the entire time it’s cooking. So, I was able to get a few other things accomplished while it worked away on the stove. Brilliant. Making Mrs. Leeper’s Gluten Free Cheeseburger (or Soy Chorizo, in my case) Mac is super easy. First…add your protein. Whether it’s a lean meat, tofu, tvp, soy crumbles, or soy chorizo (if you like a little spice! )…get that working in a pan. I got out a skillet and heated up the soy chorizo for a couple of minutes, then poured in 1-1/2 cups of hot water and 1-3/4 cup unsweetened almond milk. The sauce packet was then poured in and all I had to do was stir it all together and let it come back up to a boil. Once that happened, I poured in the pasta and gave it another stir. I reduced the heat, covered it and let it simmer for 13 minutes, stirring occasionally. The pasta actually did tenderize really quickly, so I was actually very impressed. Once the pasta reached that perfect al dente…I removed the skillet from the heat, uncovered it, and let it sit for around 2 minutes to allow the sauce to thicken. I dished this meal up into 4 portions, two for tonight for my roomie and myself and two for tomorrow (hey…dinner’s already prepared…just needs to be reheated!). And we settled in for our meal while watching Chopped. Because…that’s how we roll. One bite…and I was blown away. What great flavors. It’s like the best, warming, delicious comfort food. The rice pasta cooked up beautifully, not getting mushy and falling apart, but standing up to, not only the chorizo, but also the sauce. I loved the heat that the soy chorizo brought to the dish. The textures were perfect. And the flavors just all worked together. I loved that I was able to lighten it up using unsweetened almond milk. This does have some dairy in it…but I cut it where I could. I found this dish to be a throwback to a German dish a babysitter made for me when I was younger. It was fantastic. And I found myself savoring each forkful. I’m excited I get to eat it again tomorrow. Let’s talk ingredients, shall we? Mrs. Leeper’s Gluten Free Cheeseburger Mac is made from brown rice pasta. The sauce is made with whey, modified corn starch, tomato powder, nonfat dry milk, onion powder, sugar, salt, rice flour, autolyzed yeast, natural butter flavor, natural flavor, garlic powder, citric acid, extractives of turmeric and annatto, paprika, caramel color, and not more than 2% silicon dioxide added to prevent caking. So…not great…but not bad either. Let’s talk nutrition. A serving of Mrs. Leeper’s Gluten Free Cheeseburger Mac is 1 cup prepared. As packaged, without adding your protein, and your milk of choice, this serving provides you with 170 calories and 0.5 grams of fat. A serving will also give you 480 mg sodium and 7 grams of sugar. It is cholesterol free. And, in addition, you will be getting 2 grams of fiber and 4 grams of protein. It’s filling without being overly filling. And once you add in all your milk and proteins of choice…that all changes. Oh…I was really surprised and quite impressed with Mrs. Leeper’s Gluten Free Cheeseburger Mac. I modified it as much as I could to fit my diet and really loved how it turned out in the end. Really delicious…a hint of spice…great texture. And a happy belly when all was said and done. 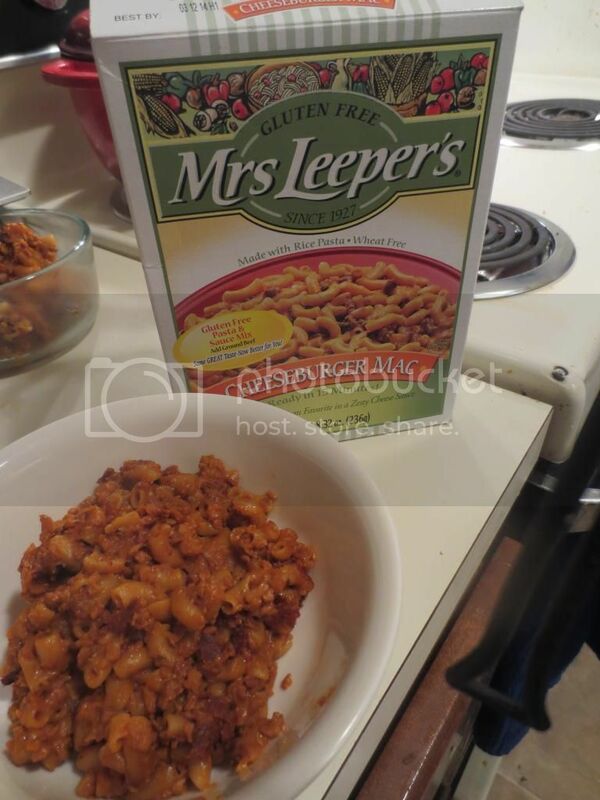 Now, I can’t wait to try more of the Mrs. Leeper’s boxed meals for something quick and easy to prepare. And it’s so adaptable. This would be good even without the protein. And I may have to try one of them like that. Or return to this one and see how it compares. As it is…the Trader Joe’s Gluten-Free Soy Chorizo was a great fit for the protein. The zesty cheese sauce played beautifully with it. I was so happy with my dinner tonight, which, after my rough day at the office…was just what I needed. Beyond impressed. This entry was posted in Cheese, Entree, Food, Gluten-Free, Italian, Mexican, Pasta, Products, Review, Sauce, Side Dish, Vegetarian by The Celiathlete. Bookmark the permalink.